San Joan de Boi is an important Romanesque church, now a museum, situated in the narrow Vall de Boí in the high Pyrenees, in the Alta Ribagorca region surrounded by steep mountains. Each village in the valley contains a Romanesque church, and is surrounded by a pattern of enclosed fields. The churches of the Vall de Boí are an especially pure and consistent example of Romanesque art in a virtually untouched rural setting. The group of churches is a remarkable example of an important constructional style in human history, like that of Romanesque art, to which it contributes characteristics that are appropriate to both its religious and its secular aspects. The Arab invasion of the Iberian Peninsula never penetrated the valleys, but they were exposed around the beginning of the 2nd millennium to cultural influences, brought there by merchants, by itinerant monks and by Christian pilgrims traveling to Jerusalem and Santiago de Compostela. In the 11th century new cultural styles were brought into Catalonia from Italy, particularly Lombardy. This new cultural movement was late in reaching the remote Vall de Boí. Dedicated to Saint John the Baptist, the building is located in the rock where the castle once stood Boi . It consists of three naves separated by arches , which correspond three apses cul- de-four at the bedside . The central apse has undergone changes in the seventeenth and eighteenth centuries , when the expansion of the village . The gabled roof is made of a wooden frame covered with slate. To the south is a twelfth- century Romanesque bell tower decorated with Lombard arches . 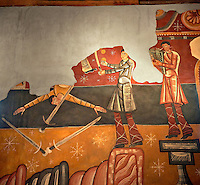 The paintings preserved San Juan de Boi revealed a very original and icongrafic program. There stands a festive scene with jugglers and acrobats, which surprised a religious context but perhaps alludes to the celebrations associated with the consecration of the temple. There is also an extensive series devoted to the saints, it belongs to the well-known fragment of the stoning of St. Stephen, as well as a magnificent beasts intradoses located in the arches separating the ships, one of the largest and unique of all the Catalan Romanesque . Most of the paintings were taken in to the National Art Museum of Catalonia in Barcelona in 1919 using a technique known as the " strappo " because it was feared that these paintings - like many others in the Spanish Pyrenees - would be sold and shipped to abroad. 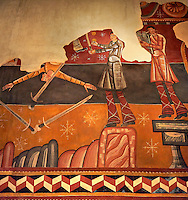 Today the St. Joan de Boi has a copies of the original Romanesque frescoes which allows visitors to appreciate how the interior space would have been filled with vibrant Romanesque liturgical art. 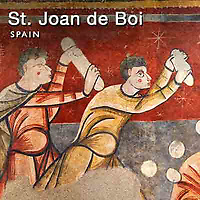 San Joan de Boi is a UNESCO World Heritage Site. Photos of St Joan de Boi can be downloaded or bought as photo art prints on line from this photo gallery.